Future denuclearization talks should pay attention to North Korean leader Kim Jong-un’s comments on the possible development of nuclear energy to tackle the country’s electricity shortage, according to Unification Minister Cho Myoung-gyon. In a television show Tuesday night, Cho said the use of nuclear energy for peaceful purposes was guaranteed in exchange for the development of a resolution of the nuclear weapon issue in the agreement of the six-party talks, in which South Korea, the United States, China, Russia and Japan participated in 2005. “Our basic stance is that North Korea’s nuclear power development for peaceful use should be discussed after the North’s denuclearization,” he said. His remarks came after the North Korean leader hinted at using nuclear power as part of the country’s plans to increase electricity supply during his New Year’s speech. “We should take the problem of easing the strain on electricity as an undertaking of the whole state, step up the construction of hydroelectric power stations, including Orangchon and Tanchon power stations, and create a capacity for generating tidal, wind and atomic power under a far-reaching plan,” he said. His comment has prompted speculations that the North could refuse to demolish uranium-enrichment facilities in order to supply fuel for a light-water reactor at Yongbyon in negotiation with the US President Donald Trump. In the speech, Kim reiterated his determination to achieve complete denuclearization while calling on his country to seek economic development and modernize its defense industry. 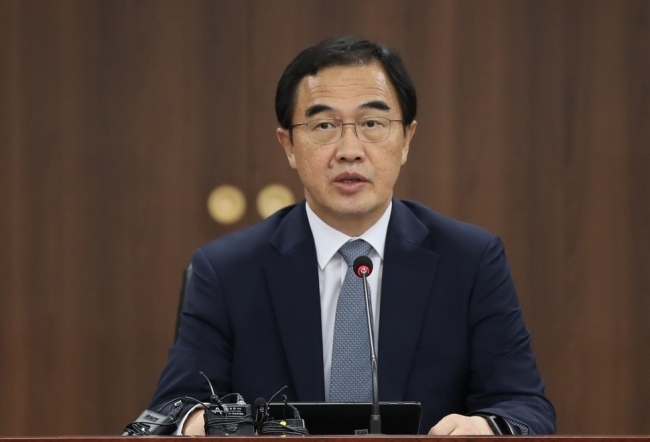 “The potential nuclear power capability could be discussed with progress on denuclearization in the future through talks such as negotiations between the North and the US,” a Unification Ministry spokesperson said Wednesday.